Please grab a napkin and prepare for drool. Don’t lick the screen, don’t do it!!! I wish computer screens tasted delicious, but I am afraid they do not. Been there, done that. Fully warned? Then scroll at your own risk. I warned you fair and square! If you have explored my blog you might have seen my original post for jackfruit sandwiches, and possibly even made it. While it’s for sure a completely delicious recipe, I felt the need to repost. Why repost you ask? (Well, you probably didn’t but I am going to answer anyway). My original recipe required almost 20 ingredients and took over 1.5 hours to cook! This does not jive with me. If you are new to jackfruit, it is indeed a fruit. You can often find it covered in sticky syrup in cans, but in this recipe the key is to use young green jackfruit that is in brine or water (not syrup). When the jackfruit is young (and not fully ripe), it’s much starchier and not sweet… It actually doesn’t taste like much to be honest. The cool thing about it is that once cooked, it has this pulled, shredded texture that is totally fun. Toss it with some BBQ sauce, and you are on your way to one of the best vegan sandwiches I have ever encountered. I’m lucky enough that I can find jackfruit in my local discount grocery store in the Asian section. If you can’t find it in your grocery store, check out Indian or Asian grocery stores, or order it online. I had a look at what a few other bloggers did with their jackfruit, and was horrified to see that many had written in the instructions to chop off and discard the core and seeds. DON’T DO THIS! You’re just wasting precious delicious jackfruit. Why oh why would you do that!? To prepare your jackfruit, drain and rinse it, then cut the jackfruit into smaller pieces. For optimal texture, cut the slices from core to the outer edge as seen in the picture above, which breaks up the tougher core as much as possible, and makes for the best “pulled” texture. Sauté onions and garlic in a bit of oil, and once tender add in the chopped jackfruit. Add in the vegetable broth and cover and simmer for another 8 to 10 minutes until the jackfruit is tender enough to mash. Once it’s mashable, take a potato masher and mash it all up until desired amount of mashedness is reached. How many times can you put “mash” in a sentence? Spread in an even layer on a lightly greased baking sheet and pop it in the oven for 15 minutes. 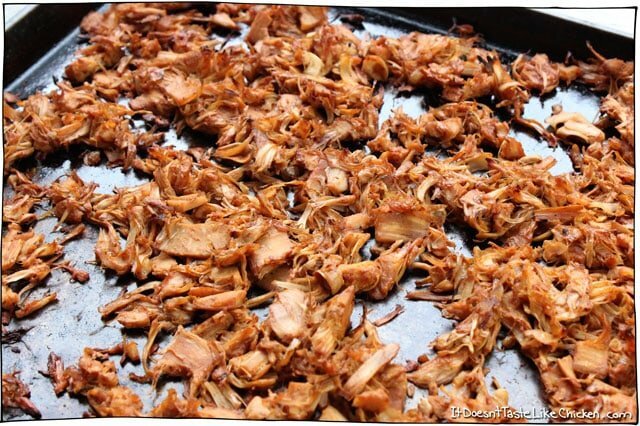 Remove from the oven and pour over 1/2 cup of BBQ sauce, and stir so that the jackfruit is evenly coated. Pop it back in the oven for another 10 minutes to make it all sticky and delicious. Stir in 1/4 cup more BBQ sauce before serving, if desired. Use the jackfruit how you like! 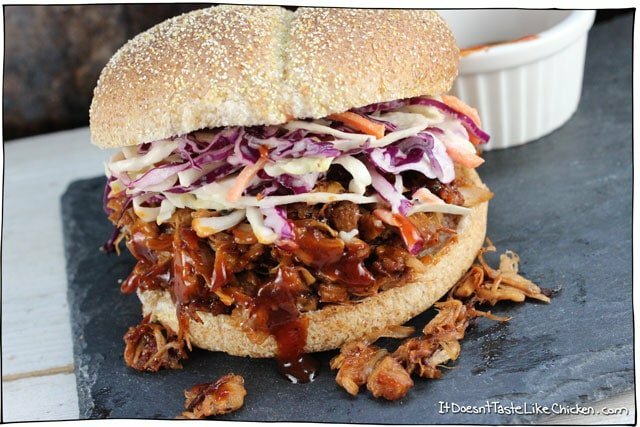 I put mine on a bun with a simple coleslaw of shredded cabbage and carrots tossed with my Coleslaw Dressing. Yum! This would also be super satisfyingly scrumptious in tacos, on pizza, or nachos as just a few ideas! Don’t be surprised if you see these recipe ideas coming up in the future. A healthy and incredibly tasty vegetarian and vegan alternative to pulled pork or chicken. Quick and easy to make. Even carnivores love it! Preheat your oven to 400F (200C). Lightly grease a baking pan. Drain and rinse the jackfruit. 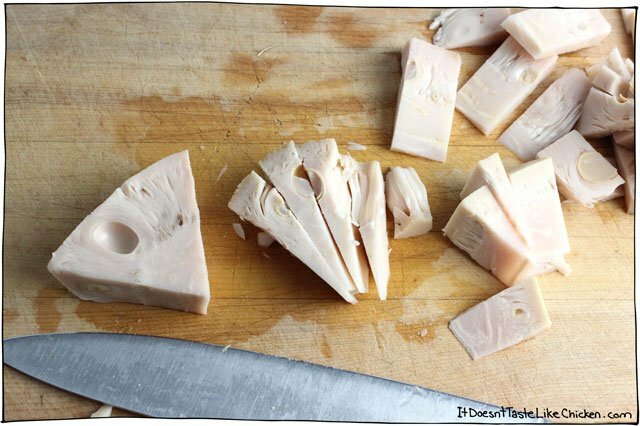 Cut the jackfruit into smaller pieces by cutting it from core to the edge for the most pulled texture (see photos). Add the olive oil to a large frying pan or skillet over medium-high heat, and when hot add the onions and garlic. Sauté until the onions are tender and beginning to brown, about 5 minutes. Add in the chopped jackfruit and vegetable broth. Cover and continue to cook another 8 to 10 minutes, until the jackfruit is soft enough that it can be mashed. 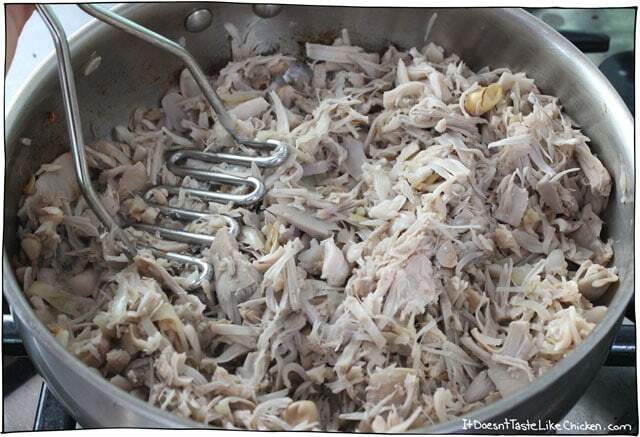 Mash the jackfruit with potato masher, until it breaks apart and looks pulled or shredded. 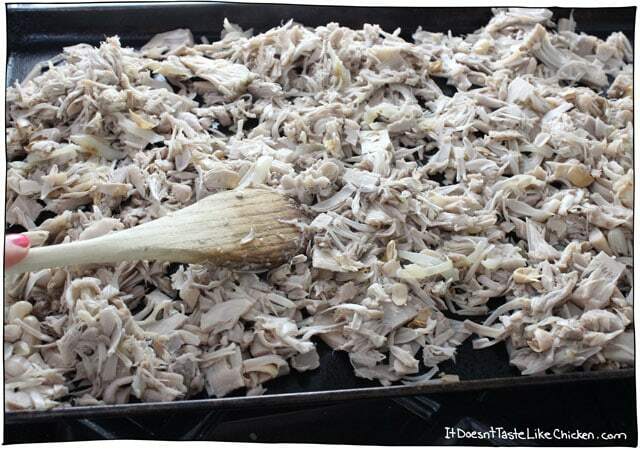 To finish the jackfruit spread in an even layer across the baking pan and then pop it in the oven for 15 minutes. Remove from oven and pour over 1/2 cup BBQ sauce and stir to combine. Toss it back in the oven for about 10 minutes, until it looks delicious and golden and even a few strands get a bit burnt. Remove from the oven and if desired stir in the remaining 1/4 cup of BBQ sauce to make it even saucier. Would you be able to make this ahead of time and heat it up. I have a couple vegetarian and a vegan coming to my wedding and we are doing pulled pork. Love this recipe! It’s delicious, quick and easy. My favourite kind of meal!! Even my omnivore boyfriend loves it!! Even my meat eating husband loved it! I’ve been vegan for 9 months and had yet to try jackfruit. I tried a recipe a few weeks ago that made it like a pot roast and the jackfruit tasted terrible. I came across your recipe yesterday and decided to give it a try because every recipe I’ve made of yours always turns out great. I was so surprised by how good this was! My husband really liked it as well. This was even better than I remember BBQ sandwiches being. Keep up the great recipe work! I look forward to trying even more recipes. Awesome recipe. I made it as it was written with a homemade BBQ sauce. We devoured it. Thanks Sam. Yay!! So happy you loved it so much, Darlene. I LOVE this recipe! I use Sweet Baby Ray’s BBQ sauce. It’s so easy! I made it a day ahead and then warmed it in a crock pot for an office Nacho party. People who tried it loved it so much they asked me to make it when we had another Nacho party this year. I didn’t label it this time and some meat eating snobs actually tried it and told me that they could not believe it wasn’t meat. It was a HUGE hit. I make it all the time for myself because it freezes so well. I use the green jackfruit in water. I made this the second week of December and it was so good .Especially when you toast those buns! I added a bit of smoked paprika because I amobsessed with it lately. I will make again. I can’t wait for summer so that we can have BBQ too! Where can I find the original 1.5 hour recipe? I get 2.2g of protein per serving if your using 4 servings. What bbq sauce are you using that is getting your protein that low? …we have a strict diet for my sons medical condition so all recipes are analyzed in our app so curious why my amount is double the protein. I used sweet baby ray bbq sauce. I’m looking for a good vegetable broth and a good mayo to buy. What brands do you recommend? It’s all I can do to put your recipes together, (cooking is not in my genes), so having the condiments ahead of time is a help. I have a veggie broth recipe here, and a mayo recipe in my cookbook but if you want storebought Vegenaise or Helmann’s vegan are both good mayos. And any brand of veggie broth should work just fine. Enjoy! Stumbled upon your page randomly and made the vegan dressings. Tried the thousand island already and they are good! Will try one dressing weekly and will try this next week. I’m just curious how long does this pulled jack fruit keep in the fridge? Since I meal prep most of my meals so I wont have a hard time prepping since I have minimal cooking skills. Again, Thank you so much for making vegan recipes easy and yummy making someone like me (with no cooking experience) a chance to enjoy vegan food! Also where can I get your cook book with the barbecue sauce? So happy you are enjoying my recipes, Robert! I would say this should last about 4-7 days in the fridge. Enjoy! I tried it, and it came out a bit sweet, and… not so good. (the can says “Young green jackfruit in brine”, just to make sure 😛 ) I felt that the sweetness comes from the fruit itself. If the sweetness comes from the fruit then it’s likely the jackfruit was canned too ripe. Young green jackfruit tastes almost sour if anything. Hope that helps! How did this recipe do as leftovers? I’m sure popping it back in the oven would help, but have you tried it reheated in the mircrowave the next day? Wondering so I can decide how big of a batch to make! I have served it as leftovers and reheated it in a pot on the stove and it was great! Hi! Love this recipe but the link to your origInal is no longer posted and I liked to use t as a reference for making bbq sauce … can you fix the link so both are available? 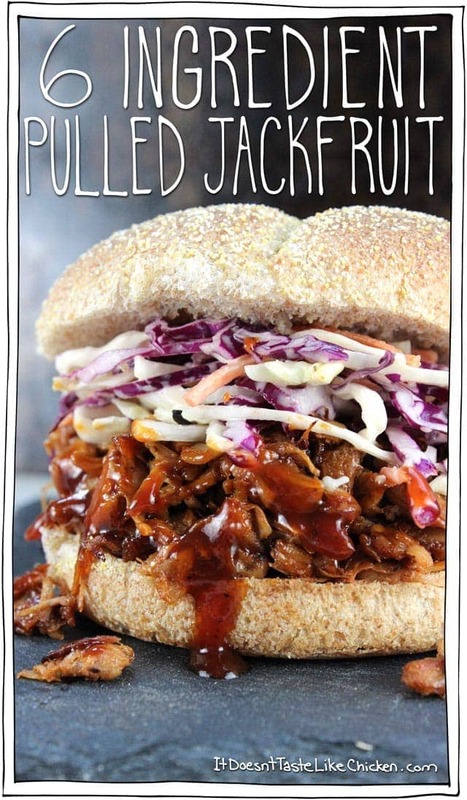 This will be my new favorite tailgating recipe, BTW, I use a barbecue recipe from the amazing vegan Candle Cafe in NYC. So good! If you are ever in NYC, check out one of their three restaurants. Just wondering if I can freeze leftovers. I bought a young jackfruit and want to do a big batch at once. I haven’t tried it myself but I can’t see why it wouldn’t work well. Enjoy! One question. Jackfruit doesn’t have protein right? How can we vary this recipe to add protein to this dish? Otherwise, like I just said…..terrific recipe. I made this for Memorial Day and my husband was in heaven. This recipe is a winner. Topped it with spicy coleslaw on home made bread. Love you Sam! I topped mine with pickled red onions and served with a side of vegan potato salad. My tummy is very happy! And hubby went back for seconds and asked for a repeat performance. Win win win!! Thank you!!! How about that cal slaw recipe? Love this recipe! Making it for a second time in a week. Thanks! Thank you so much! This was delicious.. Easy to find jackfruit at trader jos. I baked it for 35 minutes total. Great texture and taste! So happy you loved it, Alejandra! Do you think this can be done in a slow cooker instead of the oven…at least for the second time? I actually don’t own a slow cooker, so I am not that knowledgeable about them. Seems like it would work tho. Enjoy! I’m not convinced… I think it needs the oven heat to caramelise the BBQ sauce and to just “catch” the jackfruit around the edges (as per description) to get the right texture. I reckon it would be a bit soggy from a slow cooker. How hot is the oven? I know the revipe says 15 minutes…but no where does it say temperature? Wow, this turned out great! It had great flavor and texture, and the only thing I would do different is to follow the last suggestion of adding more barbecue sauce after baking the jack fruit because it was a little dry. But even without that it was yummy and I will make again! I looove this recipe! Made it with a BBQ sauce from Norway and it was delicious Going to make again! Hi I’m nervous to try this because last time I tried Jackfruit it was super slimy even in the sauce and tasted bitter. Is that normal? Does this recipe make it not taste like that? try the prepared barbecued jackfruit sold in the vegetable section of Safeway and Ralphs in California. The texture is spot on. This looks amazing! I getting married next year and am cooking all the food myself, well with some help from family, We have a few family members that are vegetarian and I don’t want to serve them a pasta dish when everyone else is having pulled pork, messy for a wedding I know, but its what I want plus it’s easy lol. I wonder if whole foods has canned Jackfruit, I live in a small town and there aren’t any Asian markets and Trader Joe’s is a few hours away. Sounds perfect! Whole Foods should definetly carry green jackfruit, and if not you could always order it online. Enjoy! 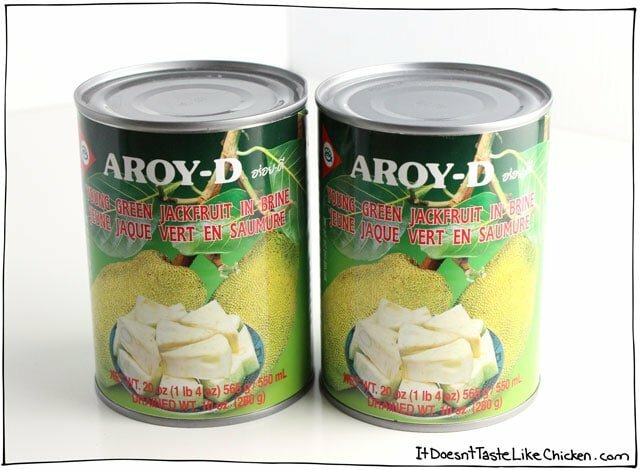 If you have any Oriental or Vietnamese stores most of them carry fresh and canned jackfruit. Amazon is where I ordered a case of Kackfeuit from-I live in a small remote town as well with limited options. Congradulations btw! Amazon is where I ordered a case of Jackfruit from-I live in a small remote town as well with limited options. Congradulations btw! I’m not sure which one I used that day, but it was likely “My Favourite BBQ Sauce” which the recipe is in my cookbook. You could use any vegan BBQ sauce tho and it will be great. Enjoy! I used “sweet baby rays!” You can get it anywhere and it vegan! Our local supermarket di not have canned Jackfruit in water. So I ventured to a local oriental market and they also did have Jackfruit canned in water. They did however have frozen Jackfruit meat. Will this work the same? The colour of the Jackfruit is yellow/orange like a motorcycle…different than the pictures shown here. It sounds like that is ripe jackfruit, and not the younger greener jackfruit so it would be too sweet for this recipe. You can order jackfruit online if that helps? Amazing! I added probably like two or three teaspoons of garlic powder after doing the last round of baking to get a flavor I like, but this recipe is awesome. Instead of the recommended pairing, I’ll be serving it with Follow Your Heart Gouda slices on hamburger buns with Just Mayo. Now I’m just waiting for my boyfriend to get home so we can devour it! Haha! Awesome! So happy you like it, Emii. Enjoy! Haha wrong comment thread, Stef! I was literally afraid of using jackfruit, I know that seems silly but I was. I’d take out the cans & look at them then put them back in the cupboard. I read online & researched but I just couldn’t do it until today. Your 6 ingredient BBQ recipe’s easy step by step took all the fear away & turned out quite well. Thanks Sam, another winning recipe! Wendy, I felt the same way! I saw this recipe a while ago and bought some jackfruit, but it sat in the cupboard for a while. I finally got the courage to try it in Sam’s Easy Vegan Jackfruit Tacos (side note: AWESOME! ), and it was not as scary as I thought it would be. I just made this and it is so amazing! I love that the texture is not mush. I had pulled jackfruit in a restaurant before and did not like it. It was just a complete mush. This is tender, but still hold some of its texture. I think the baking did the trick. Thank you so much! I’ve never tried, but I imagine it would work. Did you try freezing this? Does it come out good? It freezes great! I made this for about 30 people a few days before. Froze it and thawed it the day before. We just threw it into a saute pan to warm and then added the BBQ sauce. Worked great! Thanks for the recipe. I just went vegan last week and recipes like this make me SO EXCITED! Thank you! Is there a good slaw recipe to go with this? Okay…this was heavenly!!! I had to force myself to stop eating. 😉 Seriously! Thanks so much for the recipe!! Haha, love it! You’re most welcome, Tashina! Another winning recipe! We made this and the coleslaw recipe. Loved every bite! OMG….I JUST made this and shared the link to this recipe with all my friends, it is amazing! I cooked mine in my oressure cooker with a few cloves of minced garlic, some sautéed red onion and one “chicken” and one “beef” bouillon cube, I use Massels :)….Then I followed the rest of your recipe, its in the oven waiting for hubby to come home with some GF buns to grill, I can’t wait! howdy. I’m going to try this tomorrow. (and I realize you might not read the comments until much later) I’ve ready the comments back through January and don’t see the answer to my question (or missed it) But — I won’t be able to use it all. Does it keep its texture/flavor if I store in the fridge and reheat? Hi there. My jackfruit is cooking in the oven. The seeds have finished simmering and I’m wondering what to do with them now? (You did say keep them right!?) They actually taste ok warm, but wonder if you have any other ideas please? Just cook the seeds right along with everything else, no need to separate them. Enjoy! Thanks for your recipes…I’m a bit of a freak and don’t mind the longer recipes especially when they call for liquid smoke etc. If i were to merge the two jackfruit recipes, would I use the ingredients from one and the timing from the other, or just keep them separate? Hi Natalie, just use one recipe or the other, merging isn’t a good idea. Or you could always just add a dash of liquid smoke to the BBQ sauce in this recipe. Enjoy! I got canned jackfruit in brine and now don’t know if I should use it because of the sodium content if I rinse it really well would that take away most of sodium? The jackfruit I normally buy is also in brine as seen in the pictures above. Just give it a rinse and you’re good to go! HI this looks do good! I’m excited to bring this to a bbq tomorrow. What’s the best way to reheat the pulled jackfruit? Thank you! Hi Danielle! I think you could toss it in a pot and reheat it with a bit of water over low heat. Enjoy! I’m having trouble finding canned jackfruit, but could grab fresh at the farmer’s market tomorrow. Would that be okay? What would change in terms of preparation? Thank you! Lucky you! I’ve never actually worked with fresh jackfruit before so I’m not too sure. The jackfruit I call for in this recipe is young or green and is not fully ripe. When it’s not ripe yet, it’s more on the starchy savoury side, but when it ripens it gets quite sweet. So make sure to grab a young jackfruit. Here’s a good article on working with jackfruit that may help. I only have one question, how can I put protein in this dish, so we can feel full afterwards? So happy you like the recipe! You could serve some beans with it. Enjoy! This was just as good as when I cooked it for hours in a crock pot. If you get the canned jackfruit from Trader Joe’s, it is already cut up for you. I’m a meat eater. I make BBQ for a living and love nothing more than succulent meats and the sides that accompany them. But, for anyone who may think that this recipe isn’t going to be good, it is. I made it and fooled several of my friends. They just thought it was a new pulled pork recipe I was trying out. It’s delicious and I’ll be using jackfruit as a veggie option from now on. Made this for the first time last night. I thought it was fine. Family wasn’t so thrilled, lol. Maybe I did it wrong? Can I bake it, covered, for a couple of hours? What about crockpot or pressure cooker? I think it had a slightly tart taste that they couldn’t get over (omnis). I think it would have gone over better had I added sliced pineapple to it. The tart taste may be your BBQ sauce as jackfruit doesn’t have a ton of flavour and instead just takes on the sauce you use. Cooking it longer would just make it soggy, but you could for sure add pineapple. Hope that helps! This is the bomb. I have been vegetarian for 26 years and this is the best faux meat pulled pork sandwich I have ever eaten. I love it, as does my husband, and it will be a regular staple. Thank you so much for sharing…. This was so freaking amazing! Like I can’t get over it. I FINALLY got around to trying it tonight, and was totally skeptical. Served this to my kids (9 years and 1), my husband and my mom. Everyone loved it! My mom eats meat and would totally complain if she didn’t like it but she ate it and said it tasted like pork and was delicious. Major compliment. You are a genius!! 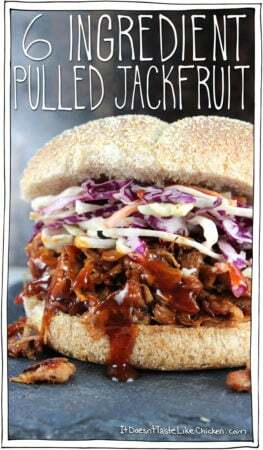 I made a jackfruit pulled pork attempt 3 years ago and never made it again because it was like bleh. But this recipe changed everything for me and my hubby! OMG! Popping it in the oven makes so much difference. Thanks for sharing Sam! Just made this for tacos! Instead of bbq sauce I used tomatillo sauce (the green enchilada sauce in the can) and it turned out so good! For added spice I also added in some crushed red pepper. Just heat up some corn tortillas add in the jackfruit, onion, garlic mixture top with a little pico de gallo and squeeze a lime! so bomb, I didn’t even tell my boyfriend that it was jackfruit and not pork until after dinner, he was so shocked! Not sure where you are sourcing your information, everything I have read says jackfruit seeds are totally safe to eat and actually have a lot of benefits. This article doesn’t source any scientific studies, so personally, I wouldn’t trust it. On top of that I found nothing but positive reviews of the health benefits of jackfruit. The jackfruit has been consumed for centuries, and the seeds are often served roasted or in stews like a bean. If you did want to take that article seriously, however, it suggests the fruit is also a problem, so stay away from jackfruit all together. It’s up to you! Personally, I will continue to dig in! I just found this post while looking for a vegetarian option. Planning to make this for a party. Can I make it ahead and keep it warm in a slw cooker? Yes that should be fine. Enjoy! Made this at the weekend, great recipe thanks. Used fresh Jackfruit, works fine. Made the slaw too, and potato wedges. Going to try this recipe at the weekend when son is home , can I use vegetable stock ? For others who might not be able to find the right kind of jackfruit locally, this brand on amazon is specifically marketed toward vegetarians and vegans to be used in recipes as a meat substitute. No ambiguity about whether you’re getting the right kind! Thanks so much for posting the revamp of this recipe. My husband and I are both vegetarians, but he really suffers from meat cravings from time to time. This will be a great way to fulfill his cravings!! I love this recipe! Thanks so much for sharing it with us. It is so simple and the results are exactly what I wanted! However, I wonder if you have any tricks for buying the *right* canned jackfruit? I grabbed a couple cans of young jackfruit in brine from Whole Foods, and when I cracked them open the fruit was pink! It also seemed to be much softer than the stuff shown in your pics. It ended up much sweeter than it should have been, although I added enough bbq sauce to mask this flavor. There was no way I could have known beforehand that the fruit was too ripe, plus it said “young” on the can and it had a “best before” date in 2018. If you have tips or tricks for avoiding this issue or dealing with it once it happens, that might be great for future recipes. Hmm… I have never had a problem with the jackfruit I have bought, perhaps the can you bought was just a not great one? You could try a different brand next time if you can find one. This is the one I buy. Hope that helps! Hi there, going to source out young Green Jackfruit as I bought the wrong one before finding your site, then I can make this receipe. Any suggestions on what I can do with the sweet version that I have already? Looking for tons of new things to do/try as my son can’t have dairy, already doesn’t like meat, but is a super picky eater. The broth is so that jackfruit stays moist and doesn’t stick to the pan. Did you make sure to drain your jackfruit first? If so, and your jackfruit was still very wet, you can just skip the broth next time. Hope that helps! Made your recipe today and it was amazing, quick and easy!! My hubby had two sandwiches…he loved it. 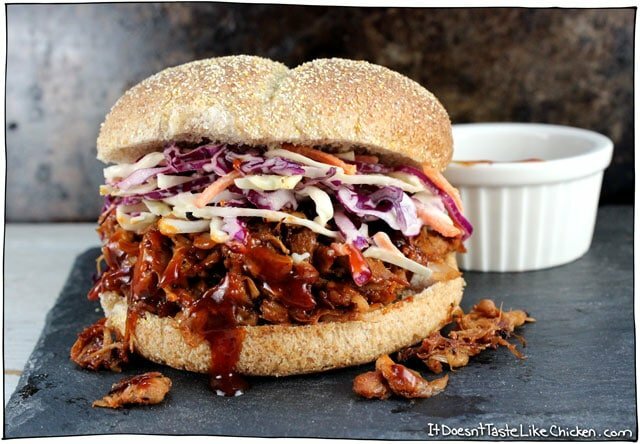 We have eaten “pulled pork” sandwiches at a few vegan restaurants here in Toronto and in BC, this was the best by far!! I don’t have access to canned jackfruit. Can I use fresh jackfruit? Sure! But I’ve never worked with fresh jackfruit myself, so I wouldn’t know how to prep it. Did you use fresh? How did it go? I did not rinse my just threw it in, simmering it now! I’ve made this version a few times now and it has been a big hit with veg-heads and meat-eaters alike. This is much easier than your earlier version, but just as tasty. Thank you, thank you, thank you! Just made this tonight and it was great! In my opinion, it was even better than the store bought prepared bbq kind. Also LOVED your coleslaw dressing. Yum! Thanks for sharing! 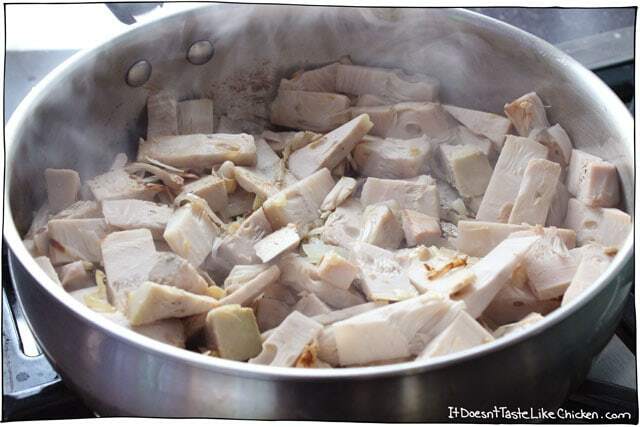 I see on Amazon that there is young green jackfruit in brine and in water. Have you tried both? Is there a difference? Does the brine raise the sodium level higher than is healthy? Or is it essential to the taste – so maybe worth the occasional health risk? Both would work just fine. The one I use is in brine, but the jackfruit in water would work too, you may just need to add a pinch of salt to taste. Enjoy! This looks amazing! I am cooking for only myself, and concerned about leftovers? Can I reheat it the next day? Can I freeze it? Don’t want to waste any food if possible! So exciting! I just received an order of canned jackfruit and intended to use your original recipe (which I’ve made and love) but this looks so much easier and faster. Thank you, thank you! Yay! You’re so very welcome Liz. I hope you enjoy this new version! I tried this earlier in the year. My Jon vegan husband and kids said, “It looks like chicken, but we known out don’t eat meat.” They were afraid to try it, and I wouldn’t tell them what it was. More for me. Hahahaha! Thanks for caring to share. Haven’t taken the Jack Fruit plunge yet, but I think this would be it. Fantastic!! I printed the recipe with the 20 ingredients to try this week and was trying to figure out when evening I had enough time to do it in. Aaannnd then I seen this repost …..thank you thank you thank you!! I’ll do the quicker recipe tomorrow night! Haha! Perfect timing!! Love it. Nope, they just mash right in and I don’t even notice them. They end up being the same texture as everything else! Interesting! I can’t believe I’ve been wasting so much prep time (and wasting so much jackfruit…). I’ll have to try it with the seeds still in. Sounds absolutely delicious. Is that the same as the ones that you served us a couple of weeks ago? I ate every morsel and licked my fingers clean. Yes it is!! I sneakily recipe test on all who enter my house! Haha. This is so timely, I actually made my first batch using a different recipe last night. The flavours were definitely there, but the recipe didn’t have me cut it up first so shredding was a LOT of work. And I wouldn’t have ever thought to use a potato masher, genius! ALSO, putting it in the oven sounds like it would make for some good cruchy bits. I will definitely follow your recipe the next time!! This post makes me super happy! I bought canned jackfruit in brine from Amazon recently to make shredded bbq jackfruit. I haven’t found a recipe that I wanted to try yet, mostly because of too many ingredients (as you mentioned) or it just seemed too complicated. This looks awesome! I’m recovering from an appendectomy but will be making this as soon as I can cook actual meals again. Question about the coleslaw dressing- any idea how much cabbage/carrots goes with one full recipe to be creamy coleslaw? Trying to decide if I need to double it for my family. I didn’t measure my coleslaw but the dressing recipe makes a little over 1/2 cup. I would say that it would easily cover 6 cups of coleslaw, but probably more depending on how saucy you like it.